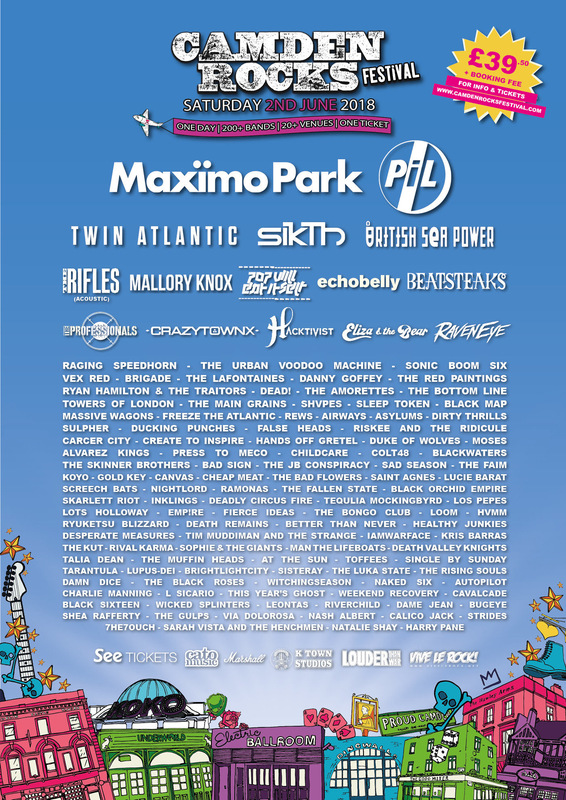 Camden Rocks announce British Sea Power, Sikth, The Rifles (Acoustic) and 40 more bands to the line up. These new headliners are joined by Camden favourites Echobelly and Danny Goffey (Supergrass) whose Britpop credentials were spawned on the streets of Camden’s most famed venues. Also announced today are The Rifles (acoustic) and Eliza & The Bear, British rockers Raveneye and 35 other bands that include: Vex Red, The Lafontaines, The Amorettes, Black Map (ex DEDG / FAR), Rews, Dirty Thrills, Sad Season, The Faim, Saint Agnes, Empire, Loom, AutoPilot (feat’ Andy from The Enemy), Tim Muddiman, Iamwarface, Kris Barras, Man The Lifeboats, Brightlight City, The Luka State, Damn Dice, The Black Roses, Naked Six, L Sicario, This Year’s Ghost, Weekend Recovery, Cavalcade, Wicked Splinters , Leontas, Riverchild, Bugeye, Shea, The Gulps, Via Dolorosa, Nash Albert, Calico Jack, Sarah Vista and the Henchman and Harry Pane.